In my post Temperature data – What it really means nearly two years ago I tried to explain what all these figures and graphs actually means – RSS MSU monthly mean anomaly, UAH monthly globally averaged lower atmospheric temperature variations, and ”actual global mean temperature” etc. 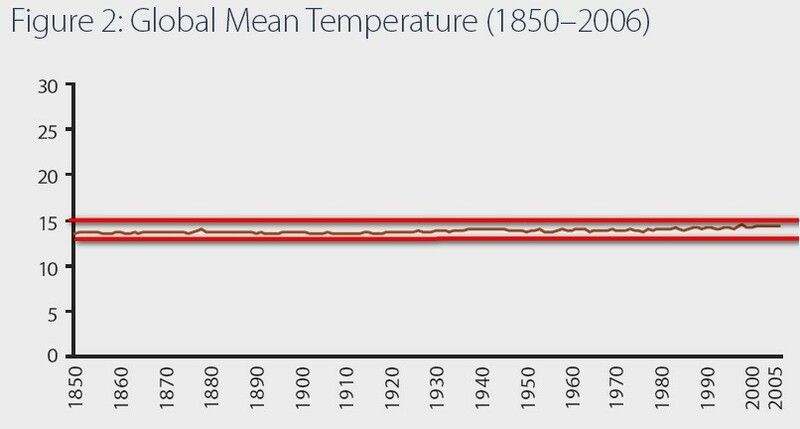 Below is the graph for the “actual global mean temperature” 1850-2006. And when you look at that graph don’t you se the HUGE variations? NO? Well you have to use at high magnifying glass to see any variations at all. I also showed the drastic temperature fluctuations over the last 2 billion years etc. Now I have found a very good video from Canada explaining “What does Average of the Yearly Mean Temperature Actually Mean?”. So enjoy this expose over the shaky ground that Global Warming Hysteria temperature “record” is based on. This entry was posted on 15 februari, 2010 at 8:50 e m and is filed under Fri- och rättigheter, Miljö - Environment, USA, Yttrandefrihet. You can follow any responses to this entry through the RSS 2.0 feed. You can leave a response, or trackback from your own site.